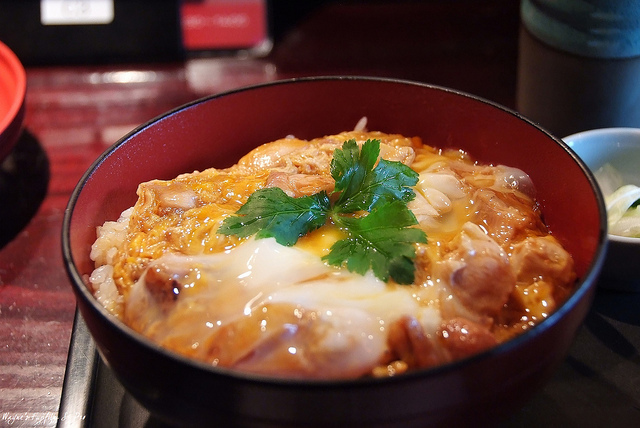 Oyakodon is one of my favorite among the Japanese rice bowl dishes! It’s quick and easy to make 🙂 “Oyako-don” literary means “parent and child rice bowl”. Does it sound somewhat weird? “Parent and child” here indicates the presence of chicken (parent) and egg (child) in one bowl. I would like to share a simple recipe from my favorite cooking video program, Cooking with Dog! Japanese seafood restaurants sometimes serve another oyako-don called “kaisen (seafood) oyako-don”, made with salmon and salmon roe. Sounds good, doesn’t it ;)? I came up with other combinations of parent and child. How about “cod and cod-roe” and “sturgeon (edible?) and caviar”. I personally am very interested in the caviar one!